Wow!! I havent blogged in 2 weeks. 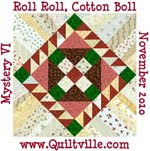 I finished all my customer quilts last Wed. and have been busy finishing up Christmas presents. Made 6 placemats today. Cut out more pillowcases. Paid bills, ulck!. Just about finished. Moved stereo around. Washed clothes. 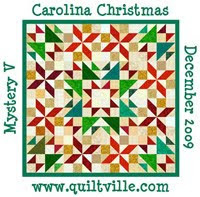 I started Bonnie Hunters Holiday mystery, Carolina Christmas. Been plugging along with it when I need a break. Not sure how I am going to put it together. Wayne got me a wonderful Christmas present. An Accuquilt Studio cutter. Like the Go, but bigger. Cuts 10 layers. We played with it with some scraps. Fun, Fun. made some flying geese and hour glass blocks and they went together perfect. I am going to really like this tool. I think Wayne will, too. After Christmas I am going make up some kits for myself. Use up that fabric. LOL. Let me tell you what happened last Sat. 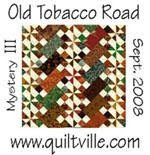 I went to People, Placed and Quilts, in Summerville, SC, with friends. It was their Christmas sale. Got some good deals. Anyway, this voice said, " I know that voice'" I turned around and there was my college roommate. She lives in Colorado now. The last time I saw her had to be 6 or 7 years ago at the same shop. She and her family were home visiting for a week. It was great to see Pam and catch up a little. I was riding with others or it would have been a longer catchup time. I am tired tonite so will say goodnite, Merry Christmas and a Happy New Year to all. Glad that you are able to have this yime to chill and work on your own projects. Merry Christmas!